From narrow sidewalk cracks to farmers’ markets and farm-to-table restaurants and back to your beloved garden, there’s no telling where you’ll find purslane. 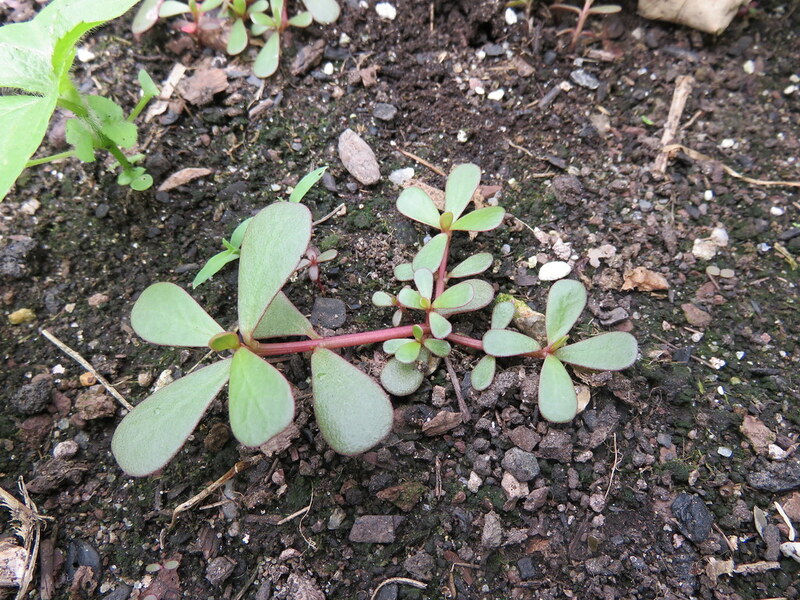 Our only local succulent weed, purslane stores water in its oval, fleshy leaves and purple-red stems. Both a halophyte (adapted to salty environments) and xerophyte (adapted to dry ones), purslane can survive in high-salt and low-water conditions—like those of a typical Brooklyn sidewalk. Purslane is a quick-spreading, low-growing (prostrate) groundcover plant, making it beneficial for erosion control. Its origins are debated, but it’s generally thought to be a Middle Eastern plant that has spread to the rest of the planet. In any case, archaeological records indicate that purslane has grown in North America for at least 2,500 to 3,000 years. Purslane is the international poster plant for edible weeds. I found recipes and culinary references spanning Portugal to Pakistan. The mucilaginous quality of the cooked plant is great for thickening soups, and its freshly foraged crisp leaves are perfect for raw salads. Toss it into stir-fries, pickle the stems, nibble on it raw—purslane is an edible weed adventure. Did you know that the traditional Levantine fattoush salad is tossed with purslane? Or that a traditional Greek tzatziki has purslane mixed in? I didn’t! I love fattoush salad, tzatziki sauce, and of course, the lemon-peppery flavor of purslane leaves! Purslane is really good for you, too. It’s rich in omega-3 fatty acids, which is uncommon in plants, and loaded with vitamins and minerals. And it provides an ecological service for the nearby plant community as well. It has both a deep taproot and a fibrous root system and is very effective at mining water and nutrients from deep in the soil. When the plant drops leaves (or dies altogether), these nutrients are released to the topsoil, rendering them accessible to plants whose shallower root systems wouldn't otherwise be able to access those minerals. More: Read about pokeweed, another late-summer weed. Some foraging tips: When looking for purslane, only harvest from places you are sure aren’t contaminated with lead and other toxins. The earlier in the day you harvest, the more sour the flavor of the leaves. Purslane’s leaves and stems are probably tastier, and definitely crisper, when plucked from a moist spot. As purslane ages or as its surroundings dry up, its texture tends to get slimy and chewy. 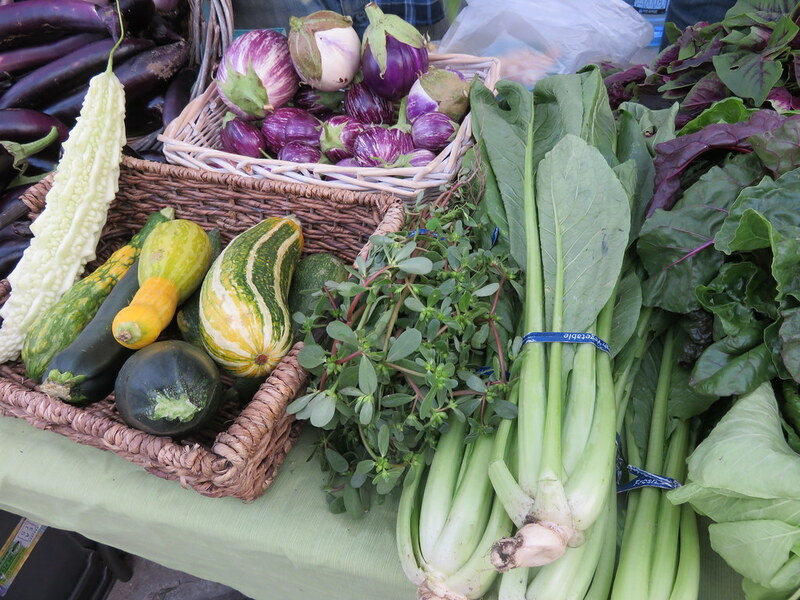 If you opt to source from the farmers' market instead, be forewarned: I’ve seen it fetch up to $10 a pound! Not too shabby for a pesky garden weed. Purslane (Portulaca oleracea) volunteering in a garden. Photo by Saara Nafici. Purslane (Portulaca oleracea) among the vegetables at the farmers' market. Photo by Saara Nafici.